Cliff Secord (Billy Campbell) is your run-of-the-mill test pilot looking for his big opportunity to make something of himself. It’s not until after Secord recovers a top-secret jetpack designed by Howard Hughes , that he realizes this just may be his chance at fame. Secord’s friend Peevy Peabody (Alan Arkin), despite the opposite from Secord, feels he should leave the jetpack alone for fear of starting something he may not want a part of. 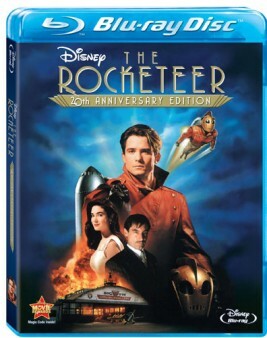 It turns out Peevy is exactly right; after saving his friend from a near fatal airplane accident at an airshow, Secord is dubbed “The Rocketeer,” a title that gains the interest of Nazi spy Neville Sinclair (Timothy Dalton). While not as good as I remember the film being as a child, I still found The Rocketeer to be quite entertaining. Yes,the action may be a bit dated, the dialogue somewhat cheesy and the acting a bit out of place at times (in particular Jennifer Connelly), but I still couldn’t help but be reminded of my childhood. Movies like this didn’t necessarily define my younger years, but definitely did start up the obsession I have with movies now. Director Joe Johnston, with this being one of his 1st films minus the funny Honey, I Shrunk The Kids, shows off early glimpses of his later films here. Items like heightened action moments, adventure filled scores, swooping camera movements and over-the-top action sequences define this movie and, if you look at his career, many other films. While this wasn’t the biggest success upon initial release, I know fans like myself are excited to finally see this arrive on Blu-ray. The 2:35:1 framed, AVC/MPEG-4 encoded transfer is quite good. Having not seen the film for nearly 10 years now, I was pleased at the restoration Disney has given this film. Darks are black and inky while the brighter colors like your sky blues never really lose much detail. Speaking of detail, whether exterior or interior, foreground or background, detail is rock solid throughout. Take a look at the final screenshot below. This is a prime example of the quality effort Disney has made here. In this capture, flesh tones are accurate, contrast levels and colors are correct. The film’s print is also in good condition as I didn’t notice any real instances of print damage, DNR, edge enhancement or any other anomalies. All in all, a solid restoration from Disney. The film’s DTS-HD Master Audio 5.1 is a slight notch above the aforementioned video. Dialogue is well reproduced via the center channel with no real instance of drop out. Atmosphere is key in this kind of film with the varying heightened action moments. Whether during the few key sequences or the quieter background dialogue moments, this track seemed to handle it all. In particular, the loud, adventure filled score from James Horner helps to add a sense of atmosphere to the film and to your living room. LFE is deep at times, mostly during when Secord’s rocket blasts off. While this track won’t be the demo disc you grab, I was still impressed with what was presented here. While I didn’t find myself enjoying Joe Johnston’s actioner as much as say his recent Captain America, I still was brought back to my childhood. Disney’s restoration is quite solid with fine video and audio. The only disappointment is the lack of features. I do suppose fans of the film will be pleased to finally see this one on Blu-ray, but everyone else I’d recommend a rental.